During Homecoming Weekend teams of faculty and students will erect a 40-foot geodesic dome on the Quad to celebrate the union of engineering and the arts. The geodesic dome was the brainchild of the world-famous engineer, artist, and inventor Buckminster Fuller, and it is his most famous creation. “From an engineering standpoint, a geodesic dome represents perfection,” says Scott Hummel, William Jeffers Director of the Engineering Division. It’s made up of individual triangles; it is the strongest structure known because all three sides bear the load. Five teams of humanities and engineering students, faculty, and volunteers. A 40-foot-wide geodesic dome will be assembled from the top down to avoid the need for scaffolding. It will take about four hours to complete the structure. Alumni attending Homecoming are welcome to assist but are asked to check in at the site to get a hard hat and safety glasses. Closed-toe shoes are also required. 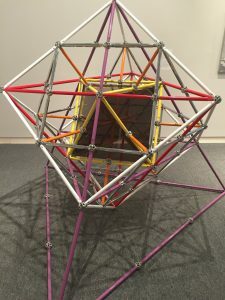 The Williams Center for the Arts Gallery’s installation through November is Buckminster Fuller: Architect, Engineer, Inventor, Artist, a survey of the legendary artist and architect’s most important inventions and cultural contributions. The gallery will be open during Homecoming. Fuller is best known for inventing the geodesic dome, which turns shapes like triangles and polyhedrons into futuristic structures. It was, however, Fuller’s ability to think across disciplines and connect the worlds of science, engineering, architecture, and design that helped influence the world of technology, ecology, and art. Popular examples of a geodesic dome include Spaceship Earth at Epcot in Disney World and the Montreal Biosphere. The exhibition centers on the Inventions portfolio, a collection of Fuller’s key patents such as the 4D House, the Dymaxion Car, and the geodesic dome. Also included in the exhibition are the Dymaxion Air Ocean World Map, Fuller’s radical rethinking of cartography that envisions land masses in their correct sizes and emphasizes that we are all connected as occupants of “spaceship earth.” The exhibition also features extensive archival material including videotapes of Fuller speaking; Fuller’s Rowing Needle, a 21-foot catamaran with twin hulls that Fuller designed for use in the choppy waters off the island where he lived in Maine; Closest Packing of Spheres, 1980; and the spectacular Duo-Tet Star Polyhedras, 1980. The idea to build a dome on the Quad for Homecoming came from Michiko Okaya, director of Lafayette art galleries, and Metzgar Professor of Art History Robert Mattison, who took the concept to Hummel. The gallery opens 10 a.m. Saturday at the Williams Center on High Street. Connection points in the dome design. Connections will be made using wing nuts. Tools required for the construction. Height of the dome. Think NBA star Dirk Nowitzki standing on a regulation-height basketball hoop. Weight of the dome. That’s 30 pounds more than two Dirk Nowitzkis. Length of all the PVC pipe to be used in the dome when laid end to end. Amount of time the dome will be in place on the Quad. Number of connectors that will be used. I live in a 39′ Geodesic dome. We broke ground for it in the spring of 1986 and moved in Easter weekend of 1987. I am going to be at Lafayette for the Alumni Choir rehearsal, which goes from 10 to 1. So I’ll at least stop by to check it out, or to help finish up if there’s still something to do.